If you’re a resident of Kalamazoo, Portage, or surrounding areas, you may have seen our new delivery truck on the road! 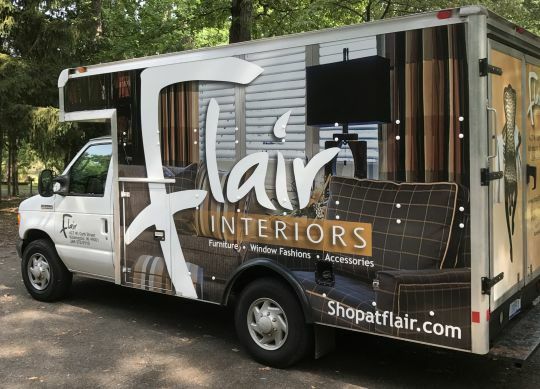 To showcase our beautiful furniture and interior design services, we recently had our truck wrapped. Displaying some of our amazing furniture and our keen eye for interior home design, it also features a link to our website. In fact, it may be the reason that you’re reading this, right now! At Flair Interiors, we strive to provide the most knowledgeable, attentive design services in the area. With a dedicated team of professionals, we have over thirty years of experience in offering high-quality custom window treatments, upholstered furniture, and interior design services. So, if you’ve been considering a redesign in your home, be sure to give us a call, we’ve got the truck ready and warmed up!